This soup recipe was kind of an accident. Here’s the story: I was up at my mom’s and planning on making Creamy Cauliflower Soup since I was still doing my 28 day reset with Jodi over at EatCleanHealth. But when I got there, ingredients she said she had (ahem, MOM.) like carrots and garlic, were missing in action. I assessed what I had on hand and started throwing stuff in the pot. And man, it turned out GREAT. So good, in fact, my mom was drinking it straight from the bowl. Its a perfect balance of spicy and creamy, and the addition of the lentils gives it a nice bulk. Can I just say it makes me freakishly happy when I improvise on a recipe and it turns out amazing. Like my mom says, make do. It’s great advice, and sometimes you really strike recipe gold! 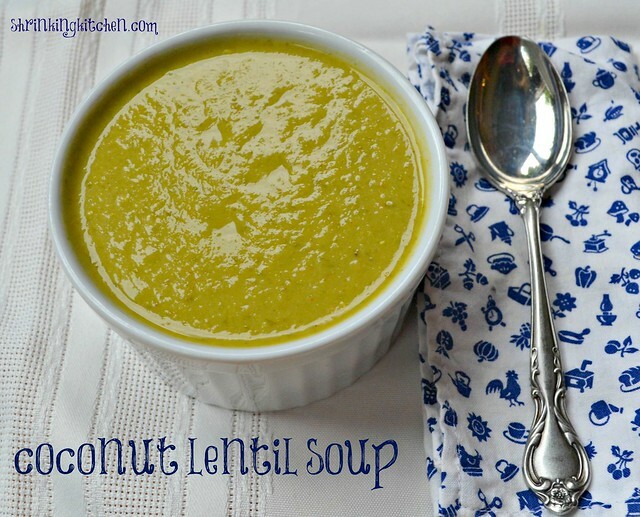 Make a big pot of this nourishing lentil soup and you’ll be set for lunch for days! Heat the coconut oil in a deep, heavy sauce pan or dutch oven. Add the onion and cauliflower and cook, stirring often, until the vegetable start to brown and soften - about five minutes. Pour in the broth and water, then add the lentils and spinach. Stir to mix. Bring the pot to a boil, then reduce heat and simmer 20-25 minutes or until the lentils are soft. Remove from heat and stir in the salt and curry powder. Allow to cool for a few minutes, then put the soup into a blender and process until smooth. You could also use an immersion blender. Pour the mixture back into the pot, then add the coconut milk and whisk together. Check your seasonings and then serve!